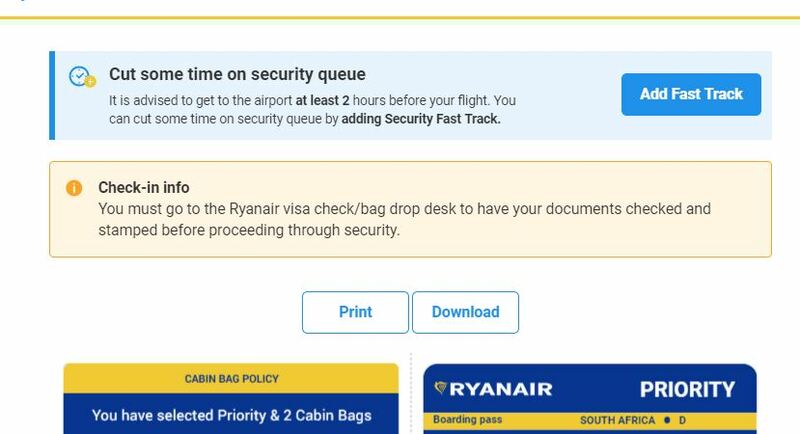 Ryanair is notorious for requiring that all non-EU passengers go through a visa check at a landside check-in desk before their flight. However, do they actually deny boarding to passengers who ignore the visa check and proceed straight to the gate? I'm not interested in what Ryanair's website, terms and conditions, or support agents have to say about this. The question is strictly about what's going to happen in practice. For the last several years I flew RyanAir, I have never had my boarding pass stamped (I have non-EU/EEA passport). I have never been refused boarding, and never seen anyone being refused boarding. They scan everyone's non-EU passport regardless of whether one did check or not. This is typical at BER airport. They call non-EU passport holders who didn't get visa check to the gate agent before boarding, and scan your passport there. They walk along the line ready for boarding, and ask who has non-EU passports and didn't do check, sending us to the gate agent for the check. Note that this check takes some time (10-30 seconds), and they do close the gate 30 minutes before departure; if you do so, try to arrive earlier than 30 minutes before the gate closure time. This is anecdotal, but here's a forum post about someone who was denied boarding at Edinburgh in March 2018 for not obtaining a visa check stamp. However, another poster says that at Edinburgh in February, the gate agent gave non-EU passengers an opportunity to have their boarding passes stamped at the gate, so experiences vary. It's clear that this requirement is not enforced consistently at all, but does appear to be enforced at least occasionally. As a Non EEA/EU from London to Madrid it was not required, but from Madrid to London it was and we were denied boarding. We had to go through the whole inmigration and security check again. Lesson learned, if you have to print your BP and it says “visa check”, you have to get the stamp. Don’t play with it; we almost lost our flight because they were not allowing us to board. My family (2 adults and 2 kids under 6) was just denied boarding at the gate because of this Visa thing with Ryanair. The airport is Eindhoven. We hold American passports and are residents of the Netherlands. They didn't care. The gate person said this was just policy. They happily went through the effort to remove our 5 bags from the flight and offered to rebook us for free 4 days later. It seems like approving a Visa at the gate would have been less effort. We are obviously not happy about it. We will not book Ryanair again. Seamus is a new contributor to this site. Take care in asking for clarification, commenting, and answering. Check out our Code of Conduct. At Basel, for flights to London-Stansted, it's done at the gate, with a Checkport (Swissport subsidary) agent verifying documents (which, however, isn't always done carefully - I've seen South Africans and Macedonians not being checked for a visa or exemption), before stamping the boarding pass (often even for EU/Schengen citizens), which is then shown at the final boarding check a few metres ahead. I suspect it varies from airport to airport and maybe even from flight to flight. My Ryanair boarding passes always say this must be done at the check-in desk before passing security. In Edinburgh in March 2018 I forgot to do it and nobody said anything about it. In Warsaw I tried to do it at the Ryanair check-in desk and they told me to do it at the gate. I live in Spain. For national flights not necessary. For international flights (i.e. from Spain to the rest of Europe) it is necessary. Not the answer you're looking for? Browse other questions tagged visas paperwork check-in ryanair or ask your own question.